The Public Enemy was a phenomenon upon its release. 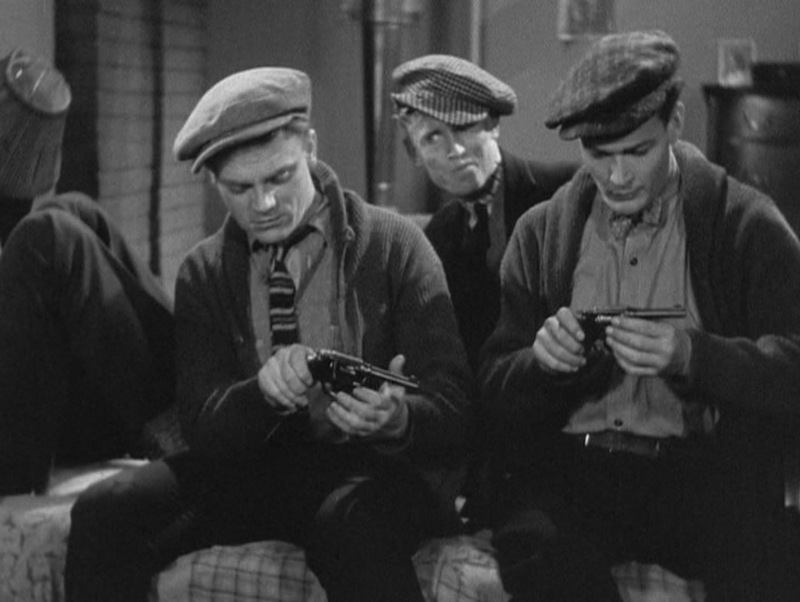 Less refined than Warner’s predecessor, Little Caesar, the movie set a new example of the possibilities of cinematic storytelling, in part due to the realistic story devised by two former low-level associates of Al Capone. 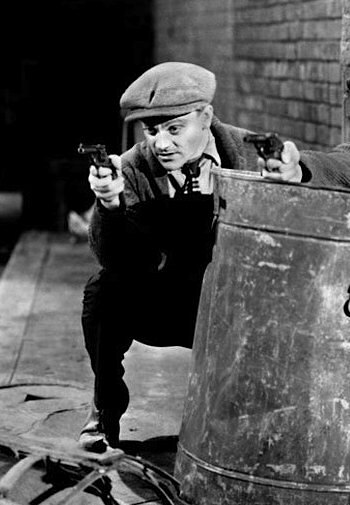 However, it is Cagney that steals the show and gives the film its staying power, portraying the titular killer with complexity yet no sentiment, whether smashing a grapefruit in Mae Clarke’s face, flirting with Jean Harlow against the side of his luxury touring car, or staggering in the street after a gun battle. 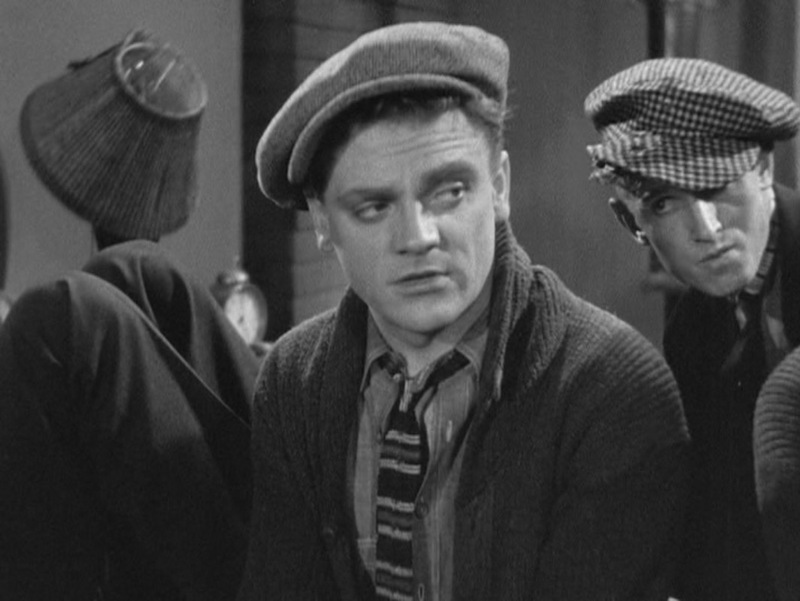 In honor of James Cagney on what would have been the actor’s 119th birthday, let’s take a look at his impressively contemporary outfit for his on-screen introduction in The Public Enemy. We first see the adult Tom Powers, as played by Cagney, in 1915. The world is at war with the United States soon to join and Tom’s older brother, the self-righteous “sucker” Mike (Donald Cook), will be leaving college to join the Marines in a few years. The only cause that Tom cares to take up arms for, however, is his own greed. In the six years since we saw them as children, Tom and Matt have grown from mischievous teens to full-time gangsters, part of a young crew run by the wily Fagin figure, “Putty Nose” (Murray Kinnell), out of his pool hall. 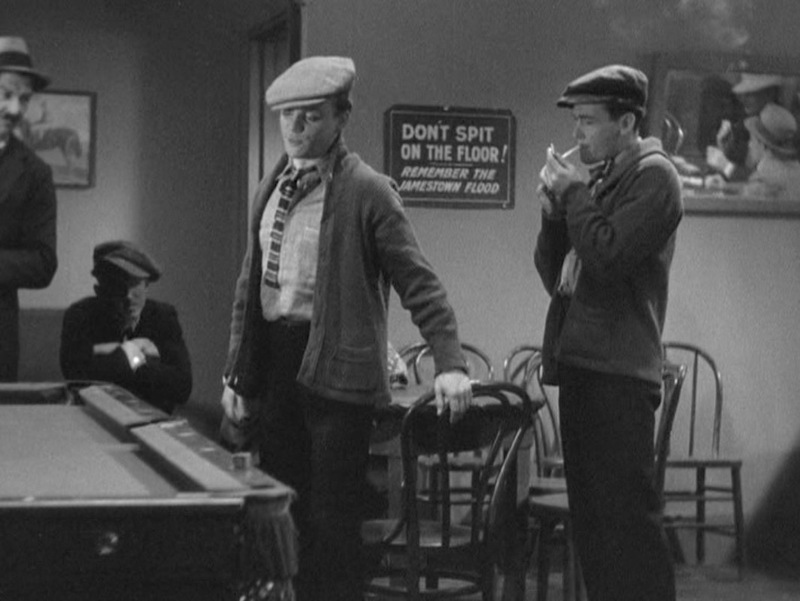 Cagney’s Tom carries himself with considerable swagger as he and Matt strut into the dive, adjusting his hat and wearing an air of insouciance as much as he’s wearing his shawl-collar cardigan, knit tie, and work boots. 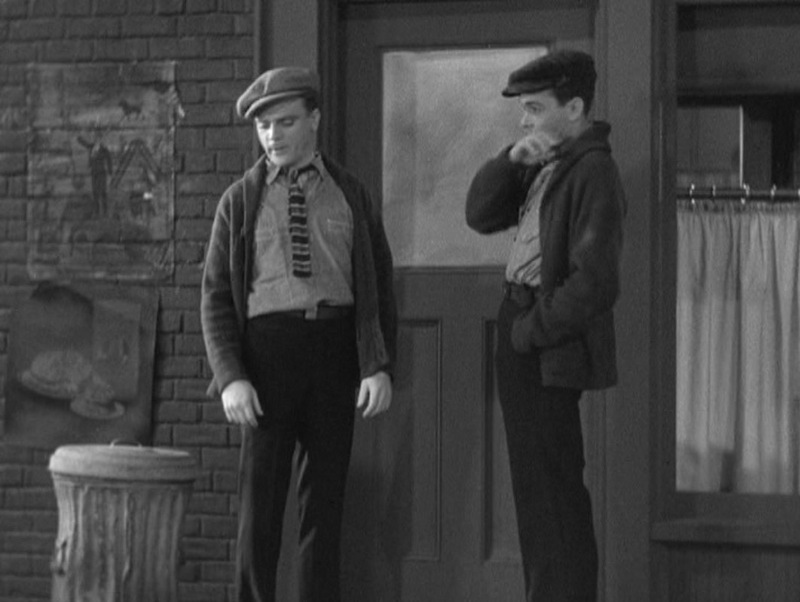 Our first look at the grown gangsters finds them both sporting dark ribbed knit shawl-collar cardigans as Tom leads Matt into Putty Nose’s dive. The insouciance with which Tom adjusts his cap and wears his half-buttoned shirt and loosened tie establishes him as the swaggering leader of the two. Publicity photo of James Cagney and Edward Woods in The Public Enemy. While the costumes match those worn on screen, their Colt Police Positive revolvers have been replaced here with smaller break-top revolvers. The shawl-collar cardigan has undergone somewhat of a renaissance of late, which some credit to Daniel Craig channeling Steve McQueen in his black Tom Ford sweater during the 2008 James Bond film Quantum of Solace. Tom’s cardigan is made from a dark ribbed knit wool with six buttons up the front, though there is a small loop on the left side of the shawl collar that ostensibly fastens to a button under the right side of the collar. There is a patch pocket with a straight-top opening on each hip, just above the bottom of the sweater. A nice touch of realism with the “Don’t Spit on the Floor!” sign, as many dives and taverns from the era evidently used the Johnstown Flood of 1889 as a cheeky – but effective – deterrent for potential floor-spitters. Tom establishes his working class status with the quintessential classic work shirt, a rugged cotton chambray popover shirt. 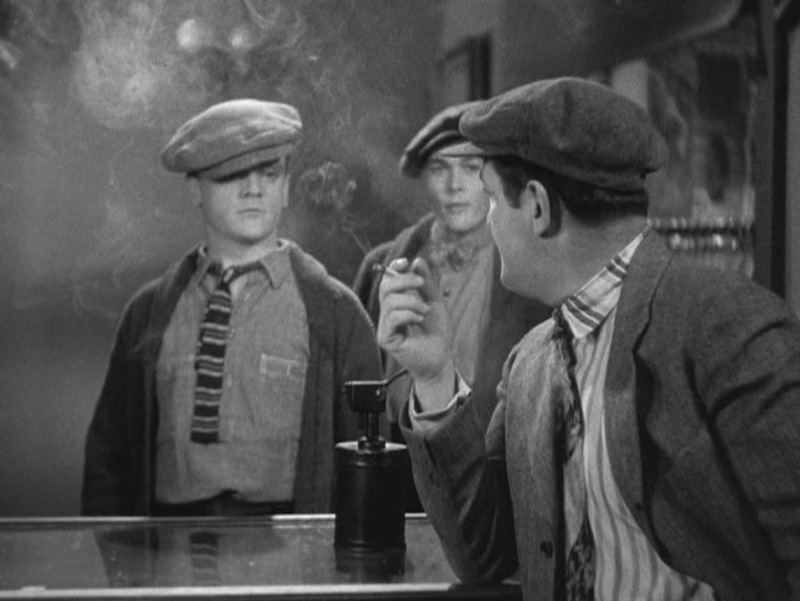 The four-button placket extends low on Cagney’s torso, and Tom curiously only wears one or two center buttons fastened. The shirt also has two patch pockets with contrast stitching and a single button-through closure. The confirmed color of this shirt, as well as most clothing from The Public Enemy, is almost certainly lost to history, but we can assume a shade of blue in the tradition of chambray workwear. The popover style dates it most to the early 20th century as modern chambray shirts are typically a full button-up style, though manufacturers like J. Crew and Lucky Brand have revived the chambray popover shirt for men and women. 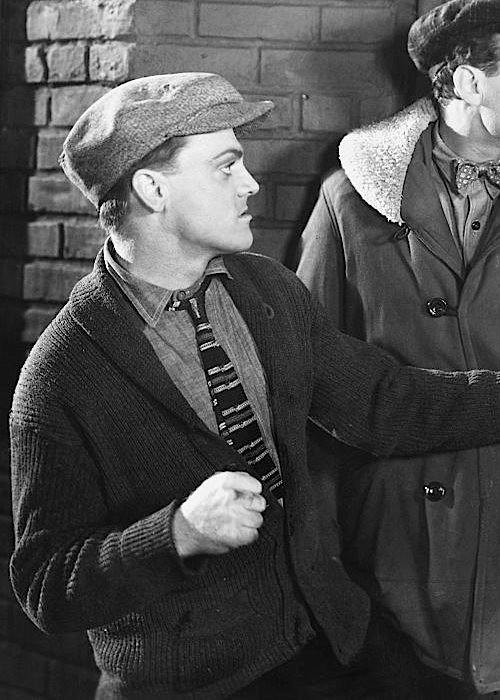 Putting Tom in a straight tie rather than Matt’s bow tie provides the opportunity for the filmmakers to subtly establish Cagney’s character as the more louche of the two, who tries to impart his idea of toughness through his rougher appearance. Wearing a tie but in such a loosened, askew manner is Tom’s way of technically meeting the era’s sartorial decorum while flaunting his desire to violate it. The slim knit tie is horizontally striped in three colors: two lighter colors in series of stripes against a dark ground. Each stripe set consists of two light-colored stripes positioned closely to each other with only a hairline of ground color showing between them, a dark ground stripe, a single mid-colored stripe, a dark ground stripe, and another set of two light-colored stripes. The bottom of the tie is flat, and – even with the loosened four-in-hand knot – it extends no lower on his torso than the bottom of the popover shirt’s placket. Tom wears very dark wool trousers with a straight fit through the legs. His wide belt is a shade lighter than his trousers, likely brown leather, with a square box buckle. Tom’s work boots are a well-worn light-colored leather which, like the belt, indicates a shade of brown – likely tan – as there were few leather color options for men’s footwear in the era of The Public Enemy, especially for a working-class type like Tom Powers. These ankle-high boots are oxford-laced with five eyelets per boot. 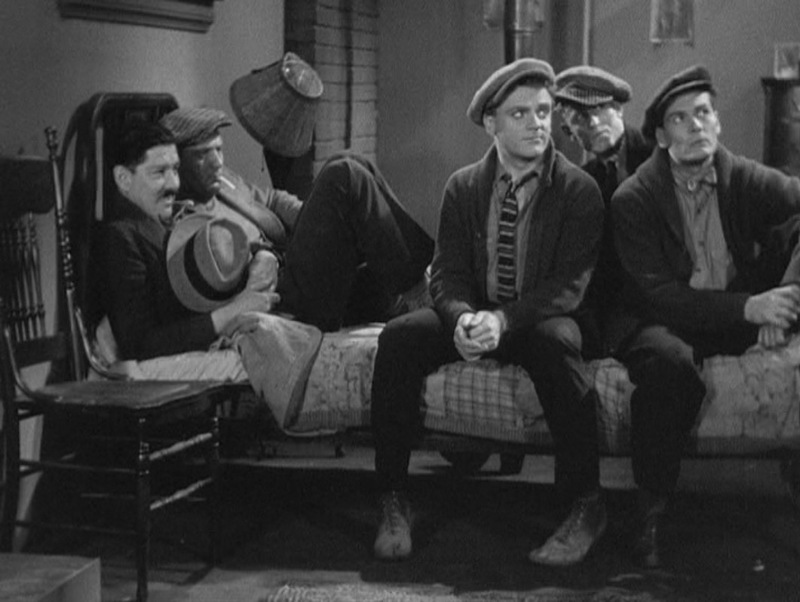 A note for any budding criminals out there… if your boss’s meeting room consists of a grubby bed in his back room where you have to sit with four other guys, you haven’t quite hit the big time. For the gang’s robbery of the Northwestern Fur Company, Putty Nose arms Tom and Matt with two identical revolvers as “a Christmas present from Santa Claus, with best wishes for a prosperous New Year.” Based on the size of the frame, the shape of the cylinder release, the unsupported ejector rod, and the grips, they appear to each be a Colt Police Positive. Tom and Matt examine their new revolvers. 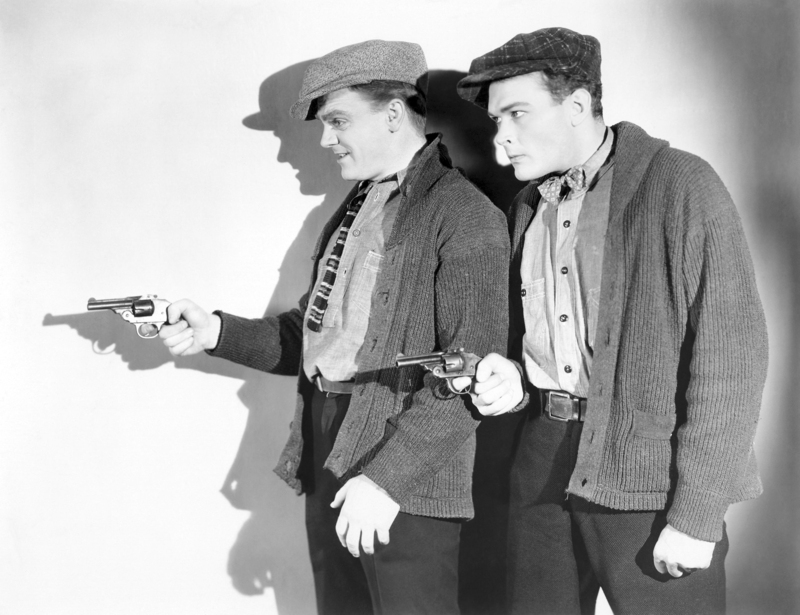 While movies of this era were not typically focused on firearm accuracy, the Colt Police Positive was indeed being produced by 1915 and thus its appearance in this scene is appropriate. The small-frame Colt Police Positive was first produced in 1907 with the Colt Police Positive Special introduced the following year. The latter revolver was designed with a strengthened, elongated frame and cylinder that would allow it to fire the more powerful .38 Special and .32-20 Winchester cartridges, hence the “Special” in its appellation. The original Police Positive was an improvement of Colt’s earlier New Police and it thus chambered the weaker .32 Long Colt, .32 Colt New Police, and .38 Colt New Police cartridges. The “Police” part of the name is obvious as Colt intended the revolver to be purchased by law enforcement departments, but why the “Positive”? A major innovation of the Colt Police Positive was the “Positive Lock” internal hammer block safety that prevented the firing pin from striking the primer of the cartridge unless the trigger was deliberately pulled, preventing accidental discharges and meaning that the Police Positive could be carried with a full load of six rounds as opposed to earlier revolvers like the Single Action Army that were habitually carried with a chamber empty under the hammer. Although the Police Positive with its smaller features and anemic cartridges ended its production run shortly after World War II, the Colt Police Positive Special went through various generations of manufacture and production ended in 1995. With more than 750,000 revolvers produced, the Police Positive Special remains Colt’s most widely produced revolver design. I wrote about how to update the look of James Cagney’s smart casual cardigan in The Public Enemy for Primer magazine earlier this year. Check it out for great modernized versions of each element from Tom Powers’ ensemble. Why, that dirty, no-good, yellow-bellied stool!